The weekend flew by as we enjoyed time with friends of many years when Laine and Julia hosted our farewell for friends in Beijing. 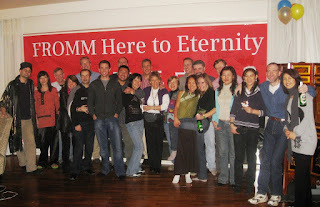 About 50 attended and signed a huge banner titled "FROMM here to Eternity. Special thanks to the organizers: Laine, Julia, Naomi, Nora, Kate, and Andy. 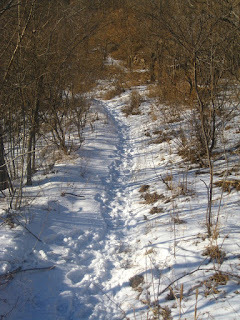 The light powder was pleasant to run in... to find the trail under the snow we often followed tracks of a lonely peasant or animal tracks... Part way through we came to a village where some men in a new BMW wanted to know what we were doing. We outran them. Down into the large valley with clear views of the mountains and the Great Wall made for an even more scenic second half of the run. As the sun was setting and the temperature dropping, we found out that 5 1/2 attendees were only half way... mainly due the the "1/2" - a 3 year old child!! Too heavy to carry and too young to walk!! how they got out is another story!! (Think about open carts, drunken villagers, icy roads - and you are only part way through the story). Liu Fu Ying (+86 13718138601) served up inexpensive and tasty food including their famous fresh grilled trout. Yum! !